The PlastikCity website focusses on improving efficiency, modernising the way the plastics industry operates. As such, efficiency was the main focal point for the PlastikCity team when they started the design and development of this new area. The initial concept was completed in October 2018, with final designs concluded by the end of November. The work was carried out on a staging site over several months, before being made live on the PlastikCity site in March 2019. 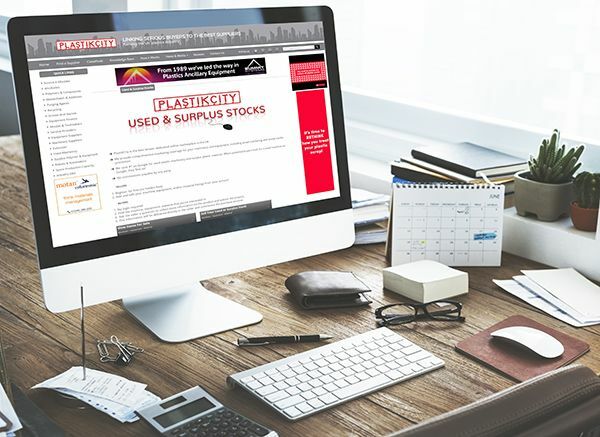 PlastikCity’s Used & Surplus Stocks section allows users in the plastics industry to buy and sell their used or surplus machinery, equipment, and material. The marketplace also enables users to list the equipment or material that they are looking to source, plus get a valuation for their used injection moulding machine. This area is mainly targeted towards customers in the UK and Ireland, although the section revamp has opened this facility up to Europe. For those who want to sell their used items, PlastikCity have now developed a seller login area and dashboard, where users can manage and edit their live listings. Enquiries are delivered directly to the seller’s inbox, and they can also see all enquiries at a glance through their personalised dashboard. Sellers can also now upload additional images and a video, allowing them to fully showcase their item for sale. Other new features include easier navigation and the option to promote their item as ‘Featured Equipment’ for additional exposure. For those who are looking to buy used or surplus equipment, PlastikCity has now made it even easier to find the item you’re looking for, using the new filter options. These options include the type of equipment, manufacturer, clamping force, material grade, plus more. The additional images and video also allow buyers to view the item in extra detail, with the ability to ‘ask the seller a question’ for further information or to proceed with the purchase. The facility is completely free for buyers to use, with no registration requirement and no hidden fees. “At PlastikCity we’re always assessing how we can improve our offering to the market. Earlier this year we overhauled the PlastikCity Partner profiles. We updated the design to give the profiles a fresh and modern look, and we implemented a new login system, giving our partners the freedom to manage and edit their own profiles. As such, rolling out a similar set-up with Used & Surplus Stocks seemed like the next logical step. This new and improved area will also be rolled out on PlastikCity’s North American platform over the coming weeks. Other upcoming developments for PlastikCity’s UK site include a revamp of the Industry Jobs section, the addition of an extensive Knowledge Base, and the expansion of the Injection Moulding Machinery category to include all technologies. PlastikCity will also continue to make further improvements across all sections of the site.